Writing contemporary history can be an adventure, especially in a country as diverse as India, where much happens but little is documented due to the lack of a culture of documentation. 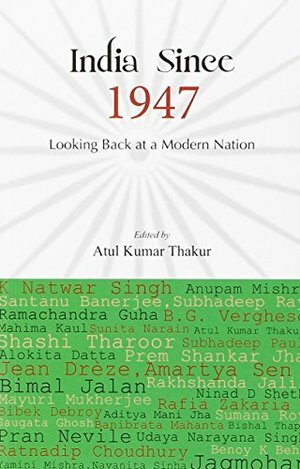 This anthology is an attempt at looking at India's history through the eyes of an Indian - through the writings of eminent scholars and budding talent - and offering a perspective and viewpoint that is unbiased, analytical and introspective but basically Indian as opposed to a western viewpoint of India and Indian history. The thirty essays included in this volume penned by India's leading scholars and insightful young writers, whose names feature on the cover, will establish interfaces in diverse domains and present an overview of modern India from the social history angle. Modern day India is very different from what it was in 1947, when it faced the challenges of existence. Now it struggles to develop, improve and clean up its systems in order to maximise its potential. Through first-hand accounts, this work attempts to describe how India handled the trauma of Partition and progressed further with radical changes in its socio-economic and political order.